1. Name and address of both parties, and signatures: State the obvious. If the parties aren’t listed, the contract is not legally binding. 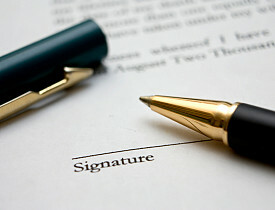 Both the contractor and homeowner should have fully signed duplicate copies. 2. List location: Another silly detail, but contracts often omit site location where work is to be performed which may be a different address, especially if it’s a vacation condo, investment property, or a newly purchased home not yet occupied. List the focus area of the project as well. For example, in a house with more than one bath, list which bathroom (upstairs, downstairs, full/half, etc.) is being remodeled. 3. Scope of services: Commonly overlooked, outlining scope of services is essential. This is what you are buying! The contract should state, in detail, the work to be performed. Terms like “using industry-approved standards” (for materials/fasteners, etc.) and building “to code” will be emphasized in this section. Ask your contractor to be specific. Discuss revisions and changes until both parties agree on content. "Include description of materials, quality and grade, items to be selected by customer, other specifications and that Contractor shall obtain all required permits and governmental inspections," warns Attorney Carl D. Goodman, an attorney in Lynn, MA who specializes in real estate-related litigation. 4. Total cost of project and terms of payment: This should be clearly and simply stated. Costs over and above the original scope of services should be discussed and for larger projects, consider placing a cap on project expenses to eliminate risk of dealing with contractors who like to nickel-and-dime you up to the high-end cost of doing business. Payments should be arranged at specific time periods and/or may be offered at certain completion points in a project. Cost for materials should be discussed well in-advance. If you are entering into a “package plan” make sure you understand limitations for budgeted items like flooring, lighting, cabinets, etc. The final payment needs to be large enough for the remodeling contractor to have an inducement to complete the job. 5. Guarantee of workmanship: Without a written guarantee, you’re at risk! "The contract should state that the Contractor guarantees all materials and workmanship for a specified period of time," said Attorney Goodman. Stay away from a contractor unwilling to stand behind the work! TIP: Take pictures or video of your project – before, during and after construction – so if something goes wrong, you’ll have evidence of substandard workmanship or damages. 6. Statement of insurance coverage: All contractors should provide an up-to-date insurance policy covering both casualty and workers compensation insurance. A copy of the insurance binder should be included as part of the contractual agreement including insurance binders for any subcontractors the contractor is expected to hire. 7. Special considerations or waiver of liability: You and your contractor may choose to draft a clause outlining considerations for anything out of the ordinary related to your project, such as unusual work conditions or special precautions. If hazardous or extraordinary conditions exist, both parties should discuss potential risk, decide how this will be minimized and outline the terms by which liability will be addressed or waived. For example, contracting for new siding installation puts you at risk of an inadvertently broken window or damaged foundation plantings. Minor mishaps may be forgiven, but potential major damage from carelessness should be discussed to minimize loss. For small projects, contractors may shy away from entering into contracts with this type of clause, but for larger projects, it’s wise to include it. Attorney Fortney recommends, “At minimum, prime contracts should include a date of commencement of the work, a project duration (time the prime contractor agrees to reach substantial completion of scope of work), and a definition of substantial completion.” In addition, “project duration is measured in calendar days or working days…” and a definition of reasonable delays may also be included, relating to weather, delivery of materials and other unforeseen factors. Laura Foster-Bobroff writes for Networx.